Both Welsh teams lost their opening round games. All games are available for download on a daily basis during the Championship on the Games page. 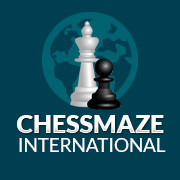 Carl Strugnell, fresh from gaining his third IM norm, dominated the Swansea International rapidplay with a perfect 9/9. The latest ECU Press Release can be downloaded here. On Wednesday 18 April Chepstow School came fourth in the finals of the ECF Junior Team Challenge, held at Hertford College, Oxford. Wales will be represented by two teams in this event, Wales Deheubarth in the Over 65’s and Wales Silures in the Over 50’s events. Tournament results for Wales Deheubarth can be found here. Tournament results for Wales Silures can be found here. Live games can be found here. Carl Strugnell achieves third IM norm at the 2017 Tralee Classic! Carl Strugnell his third and final IM norm at the 2017 Tralee Classic Section A in Ireland last week with a score of 4.5/9! A video and games are available here. The games from the Championship and Major can now be downloaded from the Games page. The charity Chess in Schools and the Communities (CSC) are holding a training day for all those interested in becoming Chess Tutors or Trainers, or heklping out in a School Chess Club orr running a Junior night at the local club. Live games can be viewed here.